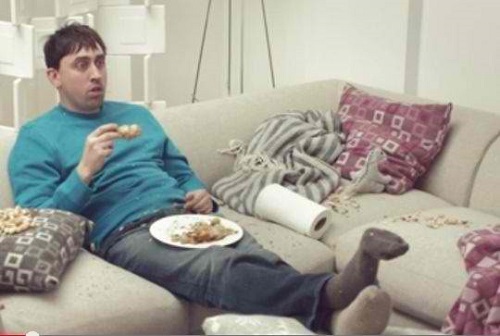 What is the distinction between casual and slob? One of the innovations that arose from the technology revolution in the 1980’s was a preference for casual attire in the workplace. Bill Gates had a hand in this, and he also instilled a management process of open doors, open offices, and open discussion in the interest of getting information and ideas out where they matter. Even stuffed shirt banks got caught up with the idea of casual, starting with a toe in the water called “casual Friday”, and then moving to full casual dress except when dealing with customers. It remained important to dress up for customers to make the statement that “we are serious about your money”. We are not casual about it. One observation during my recent trip to the U.S. was that this casual trend has gotten out of hand. My family attended “The Blue Man Group” performance at the Marco Polo Casino in Las Vegas. My expectation was that the audience would dress half-way between the dress-up attire worn at symphony concerts and the jeans and shorts that appear at sports events, weather permitting. But dress was totally casual, sloppy even, and I was the only guy there wearing a sports coat. Well, perhaps The Blue Man Group, with its crazy drummers and flying marshmallows and eyeballs in the sky, is more akin to a sporting event than a concert. But it raises the question of what kind of personal “presentation” do we wish to make in the public arena? Do we want to say we are casual and wholly understanding of the idea that clothes do not make the man . . . or woman . . . or do we want to demonstrate that we are more serious than that, more disciplined than that? More willing to sacrifice personal comfort for community well-being? One aspect of the Philippines that I have always liked is its conservatism in dress. It is nice to go to the mall and find that even the poorest among the crowd make an effort to dress up. If girls wear jeans, they put on their best pair. And generally a blouse, not a t-shirt. You also don’t see much lacivious show of skin. Filipino men tend more toward casual, but you find more long pants than shorts, compared to . . . say those hairy legged, knobby kneed, generally older Americans plodding the mall halls. The Americans project “slob” to me and I find it a tad embarrassing that we represent ourselves to Filipinos so casually, so loosely. The point is to discern whether or not presentation is important. To chefs, it is important. A plate that looks good, tastes better, more elegant somehow. To customer service agents, it is important. We take the customers’ business seriously. To schools, it is important. We insist on a certain level of discipline and propriety, or respect for others. Too much bare skin is not appropriate, nor is dirt. In the backroom of the workplace, or on the sidewalk, or in the malls, presentation does not mean as much. We are all just individuals there, free to relax if that is how we work best, or walk most comfortably. How do we wish to represent our nation? I hope Filipinos stick with conservative dress in public places, and then match that “show” with similar disciplines in daily acts. Considerate. Respectful. Right now there is a gap between show and deeds. The show is good. Too many deeds are bad. I wish Americans were not such slobs here in the Philippines. I’d rather my country-mates were more respectful of the Philippines and Filipinos. I’d rather Americans did all they could do to help the Philippines step away from poverty and loose values, and toward discipline and mutual respect. I wish they’d make an individual commitment to a cleaner, more serious, more formal presentation. I wish President Aquino were more discerning of the idea that when a member of his cabinet is linked to corruption, his agenda to clean-up the Philippines is harmed. His business is not conducted in the back room and his presentation is not good. I wish he would recognize that his agenda would be advanced if he asked that cabinet member to step aside until the matter is resolved. This is not the same as accepting an accusation as a statement of guilt. It is a way of saying that we are insistent upon good behavior, and cannot stand even the taint of wrongdoing. Presentation is a form of fact, of truth, of reality. Of values. I personally prefer disciplined to sloppy. And caring to uncaring. And respectful to disrespectful. I remember when I took oath of office for the agency where I am now, I was with another newly hired who was all dressed up for the ceremony while I was in jeans and Guns n’ Roses shirt. Ahahahaha, more power to both of you! I actually appreciate your style, as I was a long-haired banker in the days when short cuts were expected. The question here seems to me to be one of individuality versus an organized (community) dress statement. Every company that requires its employees wear uniforms goes through this thought process. My main point is that we sometimes might WANT to sacrifice personal comfort for the well-being of the community. It is an individual choice. Voluntary. I appreciate your comment. Laugh of the day . . . I observed in my recent trip that most Italians do dress up nicely, and make an effort to put artistic flair into it. Aside from nice business suits that do not look stuffy, they experiment with orange or green colored pants and they can carry them well. They complement it with nice leather bags and shoes, and sunglasses. Ah, “style”, that is what Italians achieve . . . It certainly worked because my visit to Italy remains one of the most memorable and classy of my assorted global journeys. I was mainly in Florence and Siena, and got to witness the horse race festival in Siena, which has religious origins as different sections of the city sponsor a horse. I trust you visited the Pope and gave him a few ideas? Florence was our favorite city; just the right mix of urbanization and preserved historic centers. Rome was too crowded and noisy and too touristy for us. Not so good food, too. But Florence, Siena and San Gimignano, my gawd. The views, the food, wow. Only complaint? The old streets are too steep to navigate. That paiio horse race is done in August. We got to tour the Vatican, but alas, the Pope was on a trip to the Middle East. And they really have the surliest security men. Sounds like a superior trip. I have photos of San Gimignano around here somewhere. And of the central plaza in Siena where the men are serenading their horses. This was the day before the actual event, which we watched on television as about seven horses careened into the stands on the sharp corner. The winning horse, as I recollect, had no rider. He ended up on the turf, too, but the horse still ran like the wind. Are those security guys the Swiss guards in clown costumes? Or just regular surly guys? Vegas has surly security guards, too, now that you mention it. They displayed no compassion when my young son stopped to gawk at the gamblers; they told him (me, actually) to “move along”. The costumed Swiss guards just stand as sentinel-statues very much like those in Buckingham Palace. The security guys are contracted civilians who will tell you to keep quiet, stop taking pictures and move along. Those Vegas guys may be concerned with card counters who assist poker players. Ah, my, yes, I agree. Individualism vs. community values. In some respects the Philippines has higher community values than the U.S. In other respects . . . not. I’m wondering when the trend toward community values will return to the U.S., both in its dress and politics (where State is more important than political party). And I’m wondering if the community-trend toward non-cheating will become dominant in the Philippines. I hope the conservative dress remains about where it is. Respectful without being prudish. Too bad cabinet members listed on the Napolist stay as is or “casual” instead of turning over their scope to someone who is not involve on corruption, then resign and prove their innocence. Even the senators linked to the pork barrel scam should have resigned for delicadeza. Instead, they remain and play along on going investigation while also rendering man-hours for their position. I hope the case with Ombudsman start asap. These corrupt officials can play but not for long, law maybe so slow, yet, it will grind their inner self to suffering as time nears on actual investigations…they may win with some alibis, ultimately, their sinful acts will be revealed…. Ah, very rich insights, mac. I am not sure resignation is even needed. Just go on a leave of absence. The slow pace of the justice system is for sure a part of the problem. Swift findings and decision-making would have a much more profound impact on other aspiring thieves. I also agree that the suffering is going to get mighty thick and all the attorneys in the world can’t relieve it. Nor aspirin. The last paragraph sat me upright. Clothes in that context indeed do not matter at all.